Many years ago we fought for freedom against a king. Big mistake. 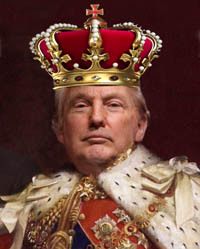 What this nation really needs is a strong leader — a king — because this Constitution, separation of powers thing isn’t working out. But what if the three branches don’t agree, so nothing gets done? Then what? For instance, I promised to build a wall that Mexico would pay for, but I didn’t ask Mexico, and now Mexico won’t pay. So what can I do? I made a promise, and how would it look not to build that wall? For more than two years, I’ve tried to get a Republican Congress to agree with me, but they haven’t, and now half of Congress is Democratic. You know how bad those people are. Bunch of rats and snowflakes. I told them I would close down the government if I didn’t get my way, and they refused, so I closed it. Now, the shithole people are whining they can’t pay their rent. My heart bleeds. Fortunately, I have McConnell running the Senate. He and the rest of the GOP don’t care whether the government is open or shut, so long as they get votes and get paid. Bunch of pussies afraid to cross me. What’s really great about this is that in the future, I’ve shown what can be done, if you have at least one weak house in Congress. I’ve proved I can close the government any time I don’t get my way on anything. Hey, if I can close the government for a stupid issue like a little $5 billion wall, think of what I could do for something really big, like cutting healthcare and Social Security, firing Mueller, and pardoning my whole family. The possibilities are endless. Yes, I’m a President who sets the precedent. That separation of powers thing was a bunch of garbage, anyway. Guys like Putin and Kim — both of whom I love, and they love me — they have it right. Make a decision and it gets done. No wasting time arguing with Congress, and no more witch-hunt investigations into my businesses and Trump University. Wait until you hear my next plan. Why start with someone new every few years? Trust me, my way is better. I know more about governing than anyone. 2 Responses to Was the Revolutionary War a waste of time? Really, who cares? They’ll vote for me, anyway.